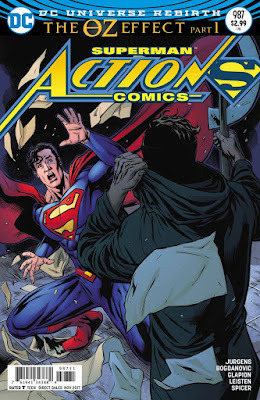 Action Comics #988 came out this week, the second part of 'The Oz Effect'. Last issue ended with the revelation that Oz was actually Jor-El. This issue gives us Oz's backstory, filling in where Jor-El has been all these years. Dan Jurgens throws in a wrinkle which I should have anticipated, linking this to the upcoming Doomsday Clock. I suppose with all the blue energy floating around the DCU these days and just how 'deus ex machina' it has been that I should have been expected this. After all, I should have been watching the Watchmen. Is it enough to make me expect the return of this twisted Jor-El? I'm not sure. And, despite a reasonable comic book explanation for Jor-El to be alive, I still have doubts about whether this is truly *the* Jor-El. I just keep wondering how someone who clearly has Green K inside his body is continues to walk around unscathed. Although I suppose 'blue energy' could have removed that weakness. 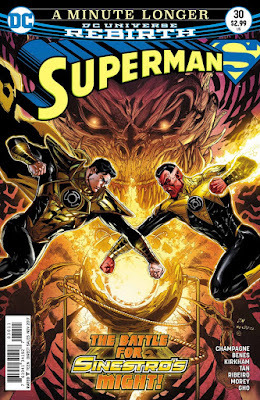 In an added treat, the art for the issue is done by Ryan Sook. I am a huge fan of Sook. I love his covers. And I will always seek out books where he does the interiors. So this was a big treat. Sook brings a nice real feeling to this story, much of which plays out on our flawed world. DC should give Sook more work, maybe mini-series that he has time to complete? I don't think anyone was truly surprised by the news from earlier this week about the Legion appearing on Supergirl this season. Between Mon-El last season and other Easter Eggs, I think most fans were expecting it. And here are some blurbs from that article. 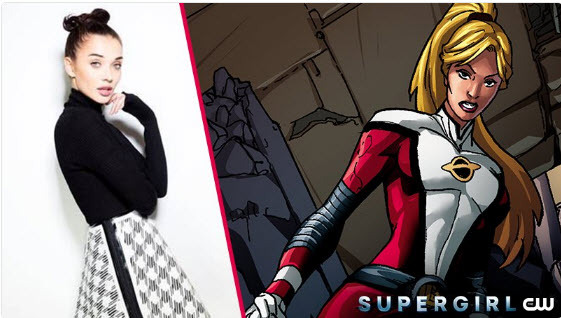 Hailing from the sixth planet of our solar system, the one and only Saturn Girl will be arriving in National City this season on the hit CW series. Played by Bollywood star Amy Jackson, Saturn Girl will mark the U.S. debut of the British born actress. Interestingly, Mon-El—who appeared on last season— is also affiliated with the Legion of Super-Heroes, but it remains to be seen whether he’ll play a role in Saturn Girl’s arrival. As for Jackson, she began her career as a model before going on to establish herself as one of India’s most in-demand leading ladies, appearing in Bollywood hits i & Theri. Along with being her first appearance on American TV, Supergirl also marks Jackson’s super hero debut. I can't imagine that Saturn Girl will be the only Legionnaire who makes it onto the show. It may be that Imra appears on one episode and the rest of the team appears later. I keep thinking the team as a whole are a late season plot point. But this is exciting. As a huge Supergirl and Legion fan, this is unbelievable and fantastic! Two weekends ago, I had the pleasure of heading to the Granite State Comicon up in Manchester New Hampshire. I have said before this is a wonderful convention to go to after the massive buildup and 'work' that I do for Boston Comicon. Granite is more cozy, more laid back, more familial. This is the con where there are usually a couple of creators for me to seek out and possibly get a commission from. As a result, I have more time to shop, thumb through long boxes, and look for comics to buy. It isn't a surprise that this is a con I head to with the youngest two Supergirls, walking to floor easily in one day and grabbing goodies for everyone. It also helps that a great little pizzeria place is right next door for annual lunch trips for pasta and calzones. This year, I was excited to see that cover artist Michael Cho was going to be a guest at the con. I contacted him early in hopes of getting a commission. Luckily his list was open on Sunday and I was able to get the unbelievably tremendous commission you see above. This is just gorgeous. I feel lucky that Cho did more of a torso sketch than just a head shot. 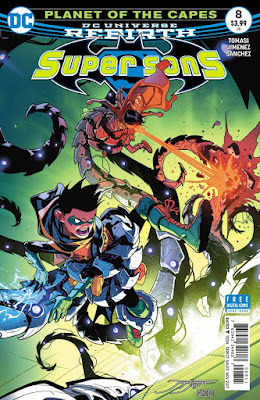 Supersons #8 came out last week and was a fun middle chapter in the Planet of the Capes story arc. The action is fun. The art is superior. The story ... well I think that I understand what is happening. Sometimes you just have to go for the ride. And I'm on board! Of course, the juice of this book is the interaction between Damian and Jon. These are two different people with two very different upbringings, trying to get work together. This issue was perhaps the perfect blend. There is that friction. There are those highlighted differences. But most importantly, they work together in this issue. It is growing relationship and respect. They may not agree with each other's methods but they know how to get things done. Peter Tomasi has done a great job using this dissonance between the sons to energize the book. That is a Phil Jimenez poster completely evocative of the old JLA/JSA covers. 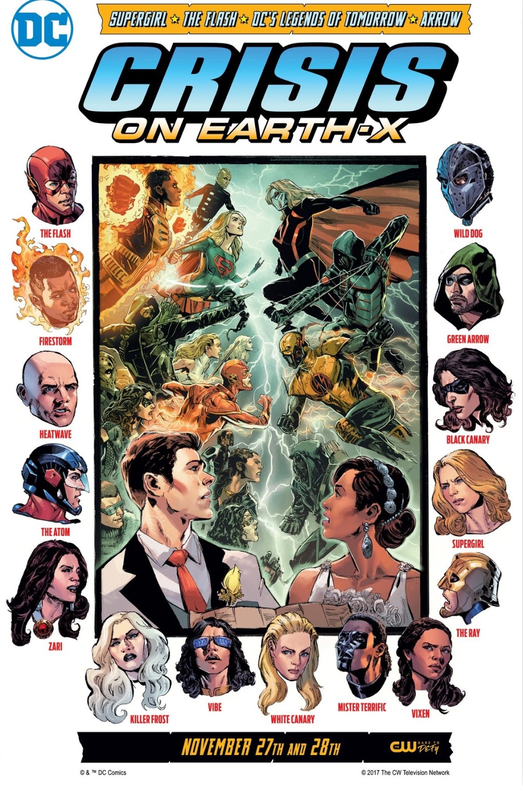 The title is Crisis on Earth-X, also leaning on those old stories' titles. And Earth-X, the world where the Nazis won WWII, is a perfect sort of villain to comment on current events, a CW bonus! And this poster is just comic joy! I love Barry and Iris in the foreground with the action behind. I love that it is a brawl that interrupts a superhero wedding, a classic trope. And I love the heads of the characters surrounding the action and looking on. And that is a boatload of characters! It's truly like a Crisis event ... just lve action. Young Anj never dreamed this possible. It is just too awesome. I am still amazed that such comic goodness is in the mainstream! Superman #31 came out this week and was a huge surprise. Why? 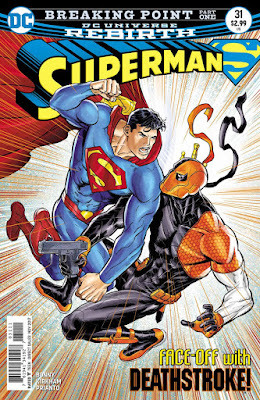 It was a Deathstroke story that I liked. A brief history. I liked Deathstroke back in the earliest days. Okay, sleeping with Terra was completely creepy. But he was a guy with a haunting past. He was clearly deeply troubled. In the end in New Teen Titans when he has a sit-down with Changeling, he feels exhausted. And that was good. Then, the 90s happened. And everything was extreme. And suddenly Deathstroke became the ultimate badass. He killed everything. He skewered people. He assassinated Firestorm. And he was everywhere. And that character archetype, the cool as the other side of the pillow, heartless killer? It doesn't work for me. And I am sure that in the 30 years hence, there are good Deathstroke stories. So when I saw this story solicited I kind of groaned. "Let me guess, Kryptonite shuriken?" was going through my already bored mind. Then I read the issue. I had never read anything by writer James Bonny, someone who has a chunk of Deathstroke on his resume. Suddenly this more complicated Deathstroke was back. Here was a guy that seems to be going through the motions of life, almost bored or mentally exhausted with his life of violence. And he has a little bit of honor. And he treats Lois with respect. In fact, this is a Lois story, not a Superman story. We see her at her finest. Brilliant. Tyler Kirkham is on art and I have waxed his car before. His art is just so beautiful. His Lois is gorgeous and strong. The action sequences feel a little static but they portray a freeze frame of the battle wonderfully. Amazingly, Metal #1 sold over a quarter million issues, something I didn't think I'd see again. After those three, Marvel dominates the next 12 slots until All Star Batman slides in at #15. It is clear that D.C. Will milk the Batman cow for all the cash he is going to provide. But we're not here to discuss Batman. Instead, we are here to discuss the sales on Supergirl. I have good news! And I can't help but think that Artgerm has a lot to do with that good news. 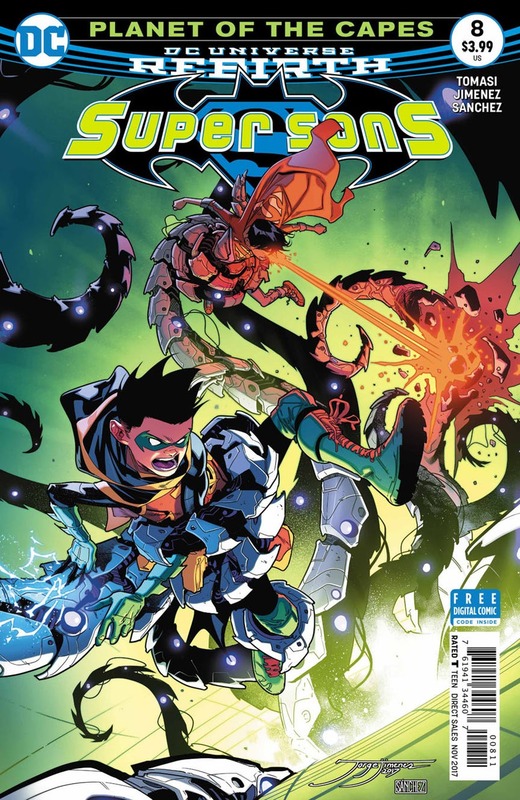 New Super-Man #15 came out a week ago and pushed forward the crazy storyline of the New Super-Man, the Great Ten, the Suicide Squad, and the Emperor Superman and his Imperial Army/White China Triad all battling it out in the streets. As much as the action is insane, a true free-for-all, it is the character moments seen between the fights that I enjoyed the most in this book. And that has been a standard compliment I have given this book. 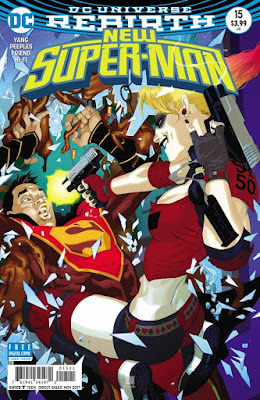 I have read plenty of super-team books and Superman analog books in my time. It is always the strength of the characters that determines if I will continue to read the book. So it really is the character progression here, more than the punching, that entertained me. The art on the book is from newcomer Brent Peeples. His work isn't as smooth and polished as Philip Tan so this issue felt like a little bit of a break from the usual feel of the book. But the scenes play out well and the panels are well composed. 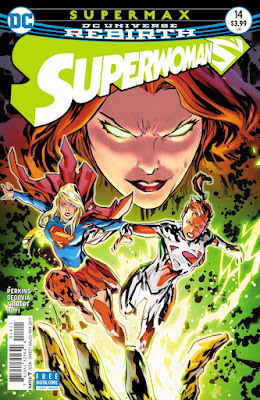 Superwoman #14 was released last week and a lot happens over the 20 pages. A lot. In fact so much happens, with so much progression and some large plot leaps, that I can't help but wonder if this was three issues of stories shoved into one. And anytime I feel like the creative team is trying to stuff all their stories into a book at the bottom of the sales chart, I wonder if the writing is on the wall. And that is a shame because writer K. Perkins has clearly righted the ship on this title. Lana is in control of her life. She is seeking out answers for who she is. She wants to be a hero. There is character growth. And it is a shame because the art team of Stephen Segovia and Art Thibert are producing gorgeous art. This book needs a little promotion, a little love from DC. And it sort of isn't getting any. So this issue sort of suffers by the breakneck speed as so much happens that I am craving the details to fill in the story. 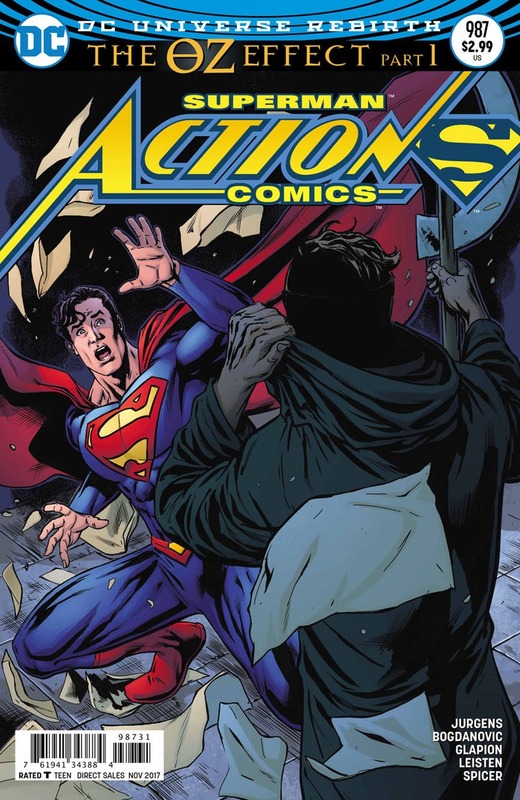 Action Comics #987 came out this week finally answering the question of 'Who is Mr. Oz?'. The story is titled 'The Oz Effect' which is appropriate given how Oz manipulates events on Earth to bring about a face-to-face between Superman and him. And the answer is ... well ... interesting if not already hinted at. The idea has been percolating through the book since the Johns/Romita Jr run. Who is this character sitting behind a wall of TV screens, talking about how he taught lessons to Superman, and capturing Doomsday, Mr. Mxyzptlk, and Tim Drake? And why is he doing all of that. Between the name Oz and the Nostalgia symbols everywhere the initial guess was Adrian Veidt, Ozymandias. Then I thought it might be Vyndktvyx back to teach Superman more hard lessons from life. And then Bleeding Cool came out with the guess of Jor-El or even Zor-El. For me, I can't help but imagine that the identity of Oz has actually changed over time. I wish I could give Geoff Johns truth serum and ask who he planned Oz to be. I doubt it's who Oz ends up being at the end of the issue. And even now I am not sure if there isn't one more reveal to come. Maybe this reveal is a feint for an ultimate reveal. "Pay no attention to the man behind that curtain!" The art on the issue is by Viktor Bogdanovic and he really shines here. Between big panels, wavy panels, and super narrow panels, the pace of the story speeds up with the art. And there are great images of Superman throughout. If Bogdanovic is being added to the stable of folks who work on this book, I'll be happy. On to the story ... spoilers ahead. 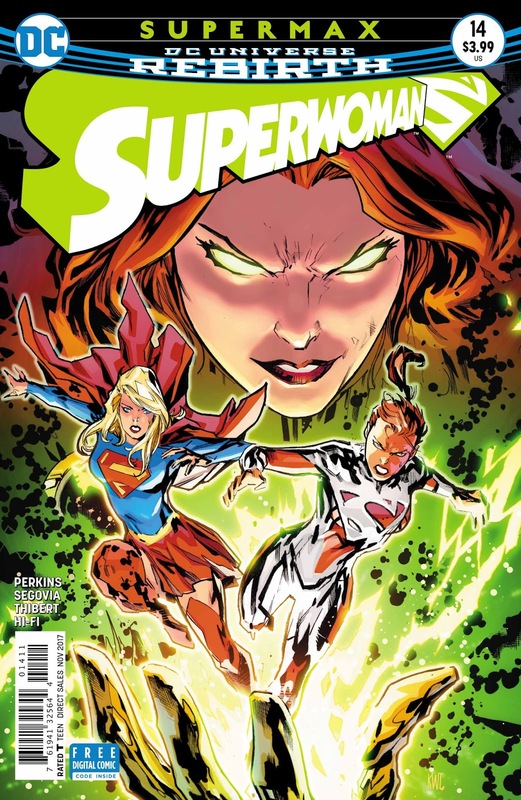 Supergirl #13 came out this week and not only wrapped up the current Emerald Empress storyline but effectively blew up the landscape of the book, resetting it a bit for the year to come. When I finished reading the issue, I sort of shook my head to grasp everything that happened. In some ways this felt like the sort of issue that happens right before a creative team shake-up, a sort of clearing of the playing field. But we know that Steve Orlando and Robson Rocha are sticking around. I wonder, if after a year of stories, the creative team sort of reassessed the book, looking at what was working and what wasn't, at what stories they wanted to tell and which they didn't, and decided to nudge the book in that direction. Trust me, I'm not complaining. There was a sense of added energy for me when I was done. Things are going to be shaken up ... and in a good way. And perhaps, most important of all, the characterization of Supergirl despite all the upheaval remained sound. I was smiling. Because it would have been easy for the writers to march down the 'dark Supergirl' road, making Kara bitter. Instead, they have her shine even brighter. I'll get into particulars in a moment. But I have to add that the addition of Robson Rocha on art has added a lot to my love of the book as well. This was a high action issue and demanded some detail and some dynamism and some 'oomph' and we got it. Add to that the Artgerm covers and suddenly Supergirl is firing on all cylinders. It has truly been the year of Wonder Woman. The Patti Jenkins movie crushed at the box office, redefining a DC superhero blockbuster movie and proving that the relentless, dark, gritty vision of Zack Snyder doesn't need to be the primary vision of the DCEU. It amazes me that the movie is still in theaters despite now being available digitally. I loved the movie. And as the news keeps pouring in about it (Patty Jenkins just got hired to direct the sequel!!) , I felt I somehow needed to acknowledge it and honor it. I also think that the Rebirth Wonder Woman book has been spectacular. Rachel Kimsey's performance of a Saiyan-like Wonder Woman on JLAction has been too much fun. The Professor Marston and the Wonder Women documentary is about to air. And DC Superhero Girls continues to plug along. Diana is everywhere, deservedly. So why not join in the fun. 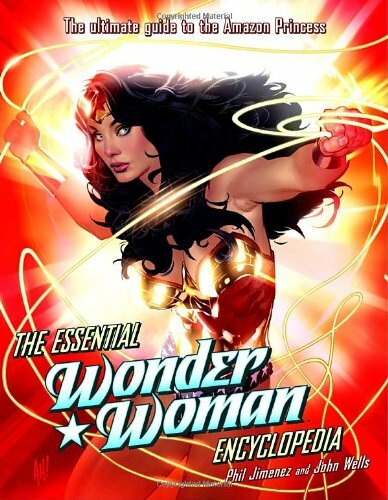 I forget if it was for a birthday or Christmas but somewhere along the way someone got me The Essential Wonder Woman Encyclopedia. Put together by Phil Jimenez and John Wells, the book is a fantastic resource. And, more importantly, seems to be cheap these days, stacked in the bargain section of my nearyby Barnes and Noble. Get it as a gift for someone! But this is a Supergirl blog. So where am I going with this? The summer is my convention season and as those who have read prior posts know, I do my best to be completely prepped. I pull books out for signatures, attempt to line up some commissions prior to the actual day, or at least eye the guest list and try to work out some priority list of whose table I'll be running to first. This year's Boston Comic Con was one of those cons that I felt a but unprepared for. Outside of chatting with Matthew Clark on Twitter beforehand, I hadn't been able to line up much. And I had a list of artists I was hoping to get who I quickly realized were outside of my price range. But here is the thing. Sometimes it all works out well. I knew Ty Templeton was going to be at the con and I love his art, especially on covers of Who's Who. I didn't even think about getting a commission from him before the show. I thought, for some reason, that maybe he wouldn't be doing them. When I found out he was, I jumped. For an absurdly reasonable price, I got this full color, unbelievably gorgeous commission of Supergirl. From the pose to the expression to the detail, it all just sings. I can't believe I lucked into this piece. 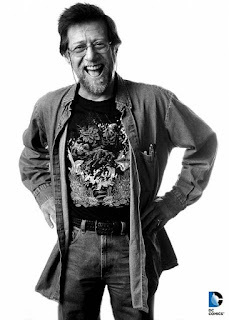 It was with great sadness that I read that comic legend Len Wein passed away this week. Wein was truly a prolific creator with a career that spanned decades. He created Wolverine. He started the All-New X-Men team which reinvigorated that franchise. He created Swamp Thing and had a brilliant run on that initial book with Bernie Wrightson. And he had a run on Spider-Man that is lauded. And that is just scratching the surface. Because he also was a tremendous editor. He edited Camelot 3000. He edited the early Moore Swamp Thing issues. His touch is literally on 100s of books in my collection. Just a force within the comics industry. Legendary. Prolific. Esteemed. Missed. 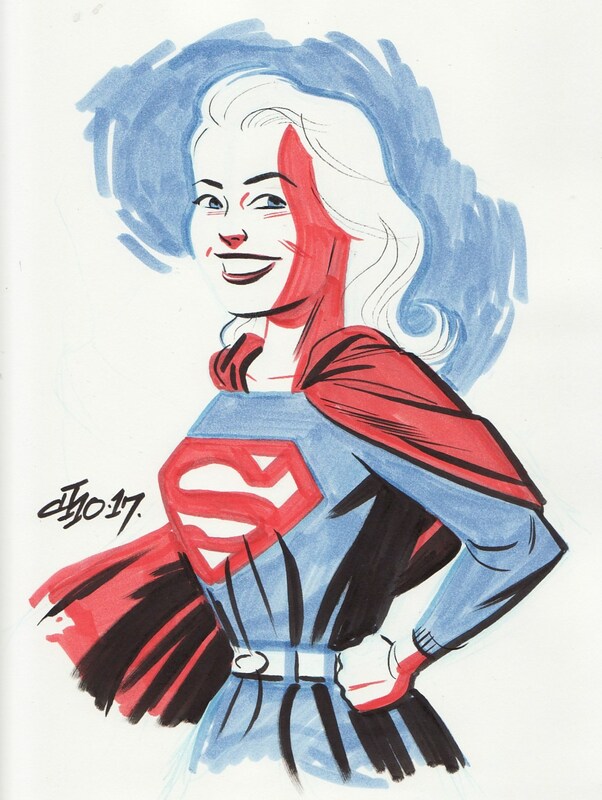 I'd be remiss if I didn't mention the fact that he wrote Superman and Supergirl every so often. In fact, two of my favorite stories where the cousins team-up were written by Wein. I have covered them both here in the past but many years ago. As I have said many times, I am lucky enough to have a number of comic conventions that are near enough to my home that I can easily attend. One of the ones I have attended regularly has been the Granite State Comicon or GraniteCon for short. GraniteCon is going on this upcoming weekend and I'll be there. Granite Con is a great con for me. After the hectic 'work atmosphere' feel that I have in bigger cons (like Boston or this year's Terrificon), Granite is a bit cozier and a bit more laid back. Of all the cons I go to, I tend to buy the most comics at GraniteCon because I actually have the time to thumb through books. This is in no ways a knock to this convention, one of my favorites. The con always gets a couple of creators who I am dying to meet. Some of my best interactions with creators has happened here including (but not limited to) meeting Aaron Kuder, Jeremy Haun, Ron Marz, Jeff Parker, and Rebekah Isaacs. And that trend continues this year. As I am only able to attend the con on Sunday, I don't know if I'll be able to get a commission ... but I remain hopeful. Superman #30 came out this week and finished the side story of Superman battling Sinestro and Parallax. It is something of a free-for-all with all of the combatants fighting each other. This had the feel of a rest issue or an inventory story, a nice pause from the underlying plots that have been bubbling in the super-books while showcasing who Superman really is. 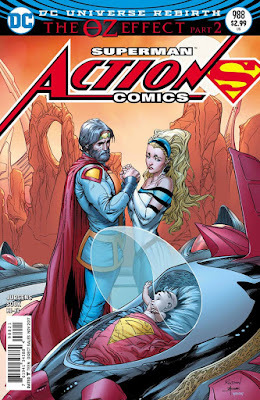 Writer Keith Champagne does a very good job of having Superman rise above and inspire. And this is especially powerful given he is surrounded by those who use fear as a weapon and fighting on the dead planet of Qward. If the Man of Steel can be a symbol of hope in those surroundings, he truly is a hero. Champagne also gives us a great moment where we get to see Superman's fears. Despite his powers, Superman still can be afraid. And that sort of insight humanizes him, makes him the relateable aspirational figure he is. And his fears are fascinating. The art is done by a trio of pencillers - Ed Benes, Tyler Kirkham, and Philip Tan. The styles are relatively similar so the issue unfolded well. There is a lot of wild, ring-slinging action that is sharp. And the colors by Ribeiro, Morey, and Gho sparkle as they lay out a dazzling array of yellows and gold. 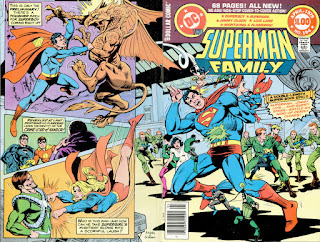 But remember that Superman Family is an anthology title and the Nightwing and Flamebird story in this issue is one I felt I wanted to cover given some interesting wrinkles in the current post-Rebirth DCU. I always love when I can look at a back issue as a sort of reflection or reference to current times. In this instance, the mystery of Mr. Oz is about the be revealed to us as readers. One of the leading candidates for Mr. Oz's identity is that he is a version of Jor-El. Back on August 24 (and echoed a week later on Bleeding Cool), I commented that Mr. Oz spelled backwards is Zor-M. I wondered if Oz might be a twisted version of Zor-El. After all, we have seen Zor-El recently be an insane mass murderer plagued by visions of demons (thanks Joe Kelly!). We have seen him be an unscrupulous scientist who experimented on his own daughter without her consent (thanks New 52)! And we have seen him turned into the Cyborg Superman, willing to kill his own daughter to resurrect himself (thanks New 52 again! The gift that keeps on giving!). So why not turn him into some universal villain. Well, I can hope not. But what do the Jor-El and Zor-El theories have to do with this issue? Well, read on. I continue my review of recent conventions with this look back again at Boston Comic Con this year. I have been collecting commissions for about 13 years now and I have a couple of basic rules of thumb. The top three is pretty easy to figure out. It is that last one that is the tricky one. I saw that Matthew Clark was going to be going to the show and I pretty much knew I was going to target him for a commission. He drew a Doom Patrol book that I loved as well as the covers for Huntress Year One. I like his style a lot. 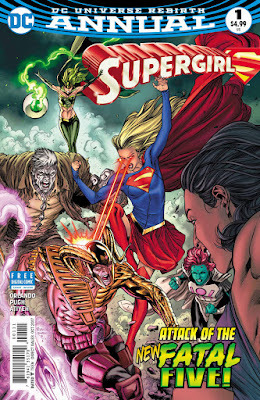 And he did the Omens and Origins story in Supergirl #38 back in the Gates/Igle run. And thankfully he was affordable. This three quarter body commission was something of a steal. Just gorgeous with all the copic work. I love the pose with one hand behind the back, adding a bit of innocence or maybe mild insecurity to the feel of Kara. And that expression is just great. Really a great addition to the collection. Hat tip to blog friend Jon Francis for sending me this fascinating ad from 1955. That's right. 1955! A full three years before the prototype Super-Girl in Superman #123 and 4 years before the introduction of Supergirl in Action Comics #252. 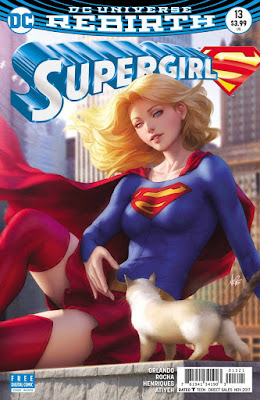 While the word 'Supergirl' never appears in this advertisement, there is no denying that the pictured girl is certainly reminiscent of the Maid of Might. From the blond hair to the blue skirt (here with red pleats! 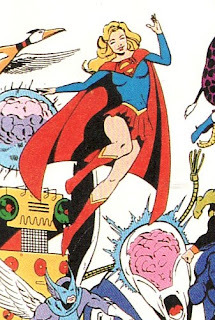 ), this looks like a young Kara getting ready for action! Maybe it even reminds me a little of the Cosmic Adventures Supergirl. 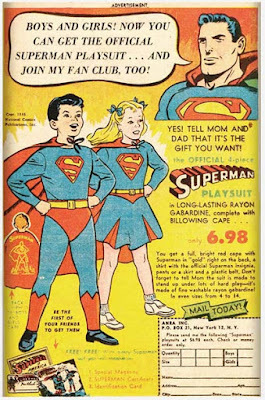 I know the Super-Girl from Superman #123 sported a red skirt, this 'playsuit' just screams Silver Age Supergirl to me. But it is the timing that intrigues me the most. 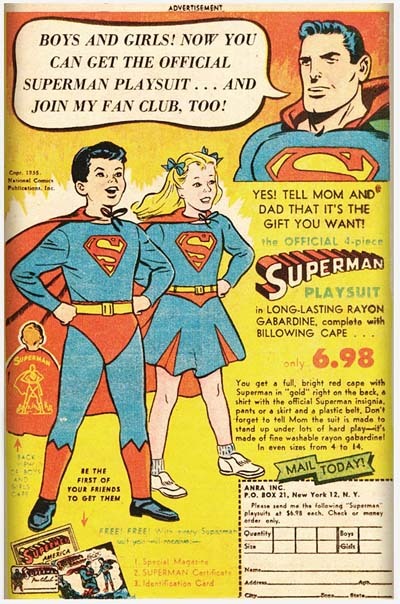 Did this sell well in 1955 making the publishers think hard about adding the character to the Superman mythos? Did this put the idea in Mort Weisnger's head to ask Otto Binder to recreate the magic he had done with Mary Marvel over at Fawcett? Did Otto Binder or Al Plastino remember this ad when they were writing Action #252? 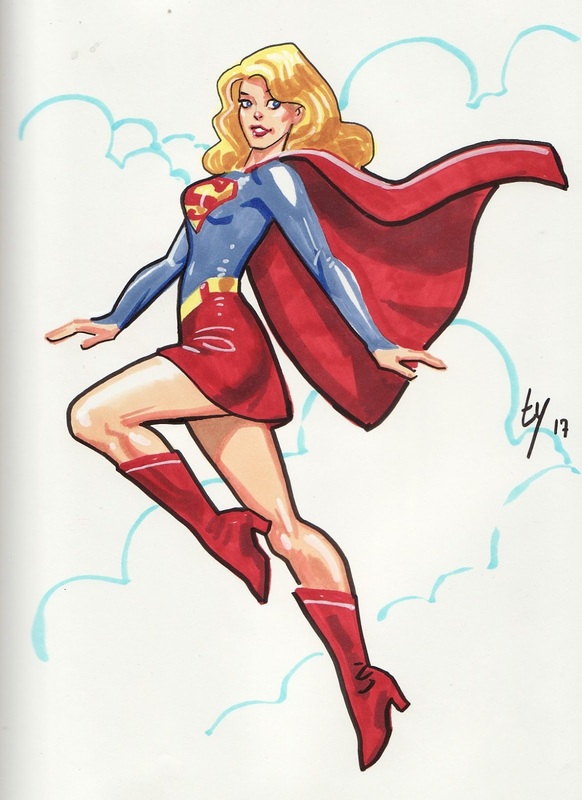 Was it this that prompted the blond hair and blue skirt of Kara? I'm afraid all of those answers have been lost over time. But it is a fun thing to speculate. Thanks so much to Jon for sending this my way and making me puzzle until my puzzler was sore. This is an interesting little tidbit for big time Supergirl fans like me. Between my recent reviews of the last newsprint Paul Levitz/Keith Giffen Legion issues over on the Legion of Super-Bloggers to my guest starring on several episodes of the Who's Who in the Legion of Super-Heroes podcast to my interactions with Keith Giffen at Terrificon, I have been looking back at the Legion of the Super-Heroes of the 1980's a lot lately. A lot. It is a great comic and a great run featuring my favorite super-hero team of all time. One of the curiosities that I love from that time period is the Legion of Super-Heroes poster by Keith Giffen. Done in 1983, this massive poster included every character that had appeared in the Legion mythos up to that point. It is an amazing piece of art. The sheer volume of characters is amazing. Kudos to Giffen for being able to do this. But did you know that there is a character that appears on the poster three times? 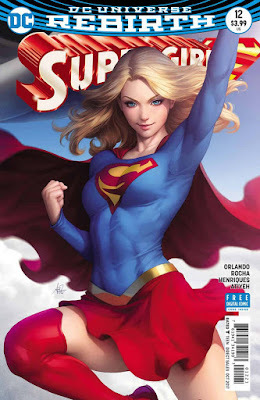 But before we get there, let's take a look at Supergirl. This was at the time when she was just switching costumes, going to the red shouldered look which she adopted in (Daring New Adventures of) Supergirl #13. Note the lack of a headband! When the costume was first conceived, she wasn't wearing it! 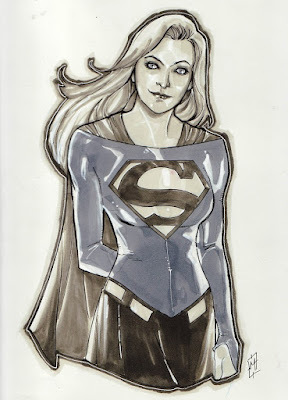 Anyways, it is a gorgeous rendition of Kara. I love her pose here, graceful and almost playful. Just gorgeous. But who is represented on the poster three times? Supergirl Annual #1 came out this week, a middle chapter in the current Fatal Five storyline and boy, was this one busy. Writer Steve Orlando keeps things moving forward at a near incalculable speed, switching scenes, having characters move in and out, and revealing plot points in a machine-gun style. This was one of those issues that while I was reading I needed to flip back a couple of times to make sure I knew where the action was taking place. It also was one of those issues that I read twice in the same day to make sure I understood it all. In some ways, that rat-a-tat style works well for a summertime annual. Like an action movie, the pacing was so brisk that it felt like a roller coaster ride. In some ways, it didn't work for me as the information flowing was happening so fast that I needed to pause and absorb it (or reread it), breaking that momentum. Perhaps I am being too grumpy. There is a lot happening here. But I shouldn't complain when most of the time I am complaining that nothing happens in comics. The art here is done by Steve Pugh. Pugh's art has certainly changed over time. His work on the Vertigo Animal Man back in the early 90s is the style that I have imprinted on. This seems a bit more straightforward than that thick-lined style. Buckle up your seatbelts. We are moving on to the story.